I only needed two pieces of equipment in the garden today, but I think these are the best of their kind: Deer Scram and studded Muck boots. Muck boots come in lots of variations, but these have high, water proof, insulated uppers and metal studs all over the soles. Very punk-culture and very handy for navigating the packed-down, frozen paths on our hill. I think I picked these up through the awesome folks at Sierra Trading Post a few years ago, but their inventory comes and goes – I don’t know if this particular model is still available. If you find them I can guarantee you’ll never slip on ice or snow again. You’ll have to take them off before you go back inside because they’re holy terror on floor boards, but it’s totally worth it. 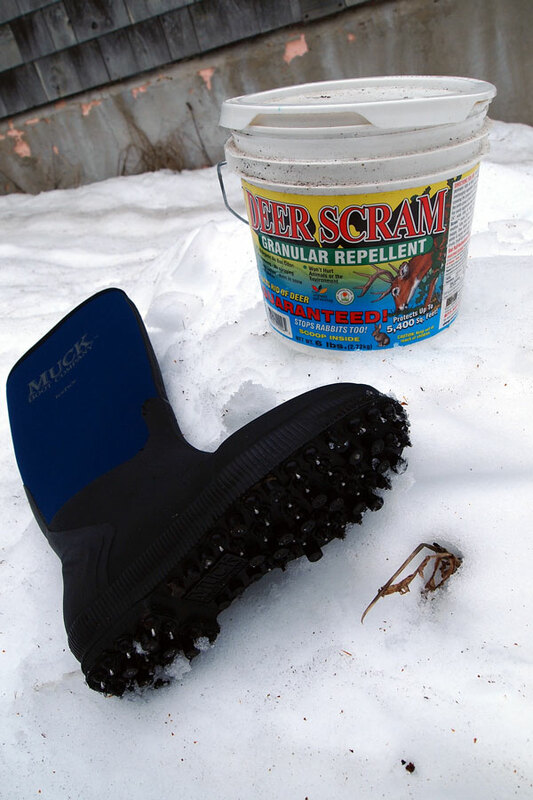 Deer Scram is another great invention – powdered deer and rabbit repellent so you don’t have to use a sprayer in sub-freezing temps. 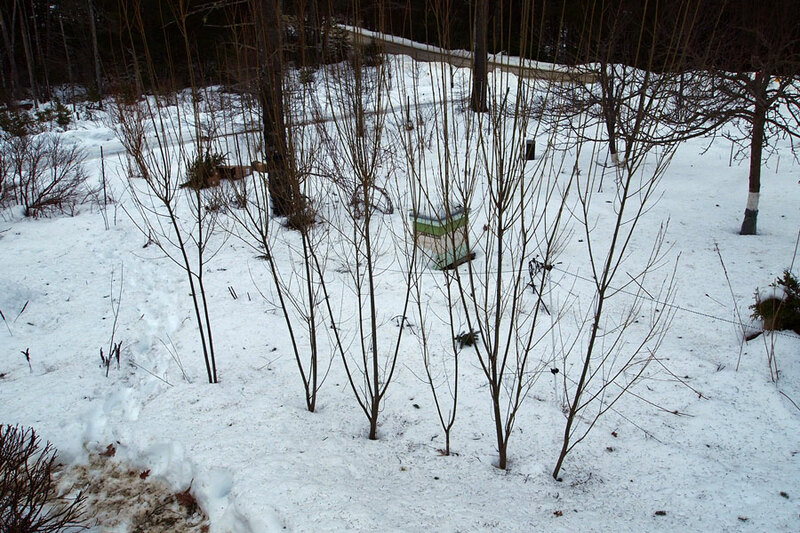 This afternoon I followed deer tracks out of the woods and into the gardens to broadcast powder wherever it seemed I could head them off, paying special attention to particularly attractive targets like the cherry trees. It seems to discourage the deer establishing pathways where I don’t want them to go – and where they wouldn’t intrude if the electric fences were on. 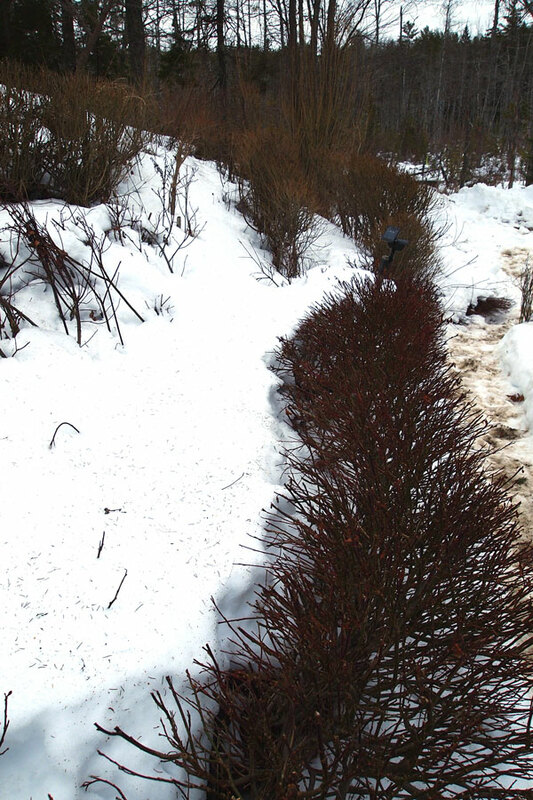 and the withy holding back the south slope improves in size and density every year. 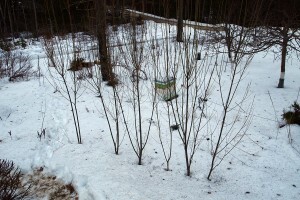 This entry was posted in gardening, horticulture, Maine, perrenial, the neighborhood and tagged garden, winter, withy on January 12, 2013 by APo.